You ready, partna’? Help protect the train in Wild Wild West: The Great Train Heist Slots and you’re guaranteed to win win win! Good luck! Giddy up! You’re invited on a Wild West adventure in Wild Wild West: The Great Train Heist Slots! Save the day from the 4 armed bandits who are trying to rob the train. What’s in it for you? 4 Wilds, including an Expanding Wild, Multiplier Wild and more, FREE Spins and up to 50x Multiplier in the Pick and Click Bonus. 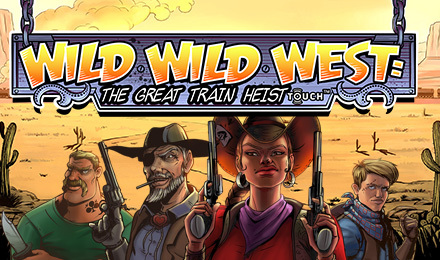 Wild Wild West: The Great Train Heist has 5 reels and 10 paylines, plus a 96.75% RTP.